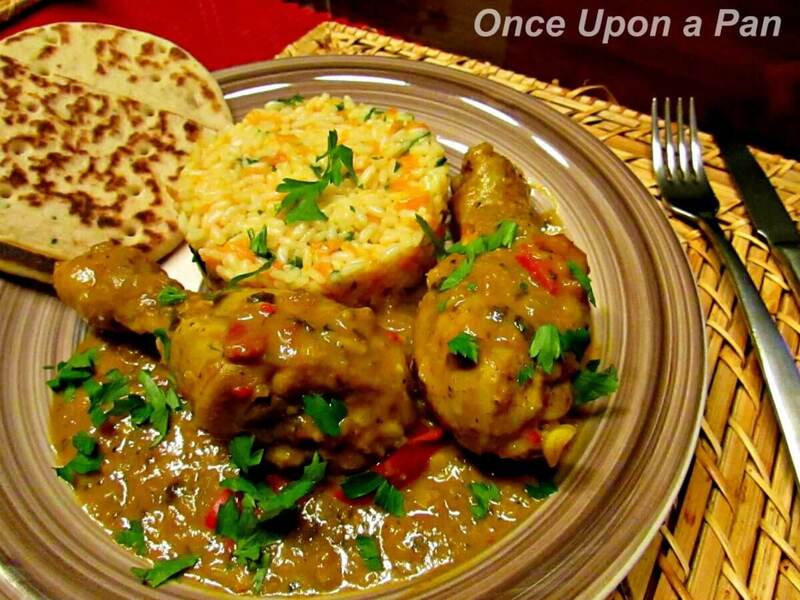 Trinidadian chicken curry is basically a dish from Trinidad and Tobago. Strange isn’t it? You hear curry and you think India, no? Well, I thought the same and was wrong: curry is also very popular in the Caribbean. We learn new things everyday! I knew the curry powder was also used in the Caribbean cuisine but not in such a similar way as in India. As you can see, this is a very simple recipe which makes it perfect for a quick week night dinner. Sometimes, curry recipes involve different combinations of spices, but this one is simply curry powder and turmeric. And you know what? Less is more sometimes. We really loved the simple but delicious flavour of this curry. I served it with carrot rice and flat bread but you can add potatoes to the sauce. enjoy! In a food processor, chop half the onion, tomato, coriander, garlic, jalapeno pepper and black pepper. Add the mixture to the bowl with the chicken. Stir the whole mixture together so that the chicken is totally coated in the seasoning ingredients. Allow the chicken to marinate for at least 2 hours. After the chicken has marinated, make the curry slurry: add the curry powder and turmeric to a bowl, pour in 3/4 cup water and stir until dissolved. In a large skillet, heat the vegetable oil over medium-low heat. Pour in the curry slurry and cook for a few minutes, stirring constantly. Curry slurry will deepen in colour. If the mixture becomes too dry during cooking, add a little water. when the curry slurry has become a thick paste, chop the other half of the onion and add it in. Allow the onion to soften, then add in the chicken. Stir to coat the chicken, then cook, half covered, for five minutes. Turn the chicken, then add in 1 to 2 cups of water. Shake the pan and allow the chicken to cook until done, stirring every five minutes. Cook for about 20 to 25 mins. At the end, be sure to taste and adjust salt and pepper. Serve with rice, spoon the sauce over the top and sprinkle with fresh chopped coriander.